It has been a very long time since I felt like posting about my cross stitching. Real life, work and health issues have been getting in the way of some of my more pleasurable pursuits these last few years. Plus, since my job keeps me at the keyboard all day long, my continuing struggle with CTS (carpal tunnel syndrome) often cuts short the hours I can comfortably use my hands after working hours. 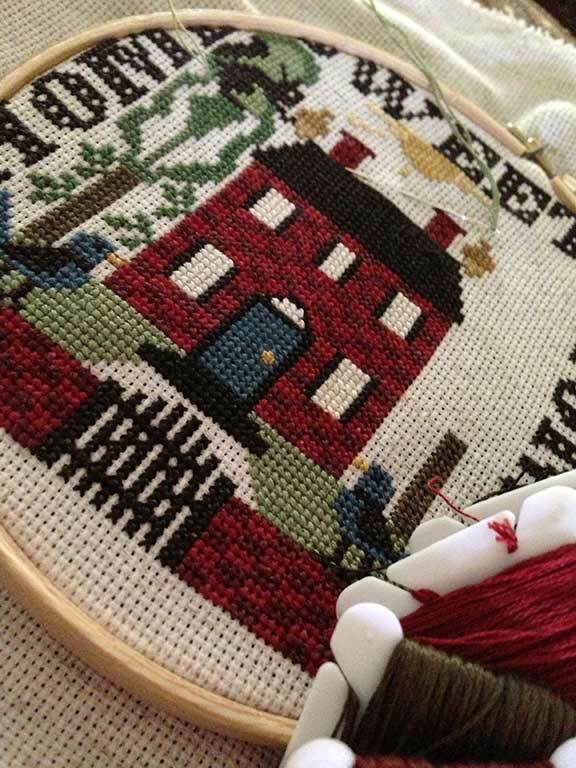 That said, a few months ago I was able to take up an old, unfinished Prairie Schooler “Home Sweet Home” cross stitch, and it’s almost done now. I changed the design slightly, removing the cat figure and adding another bird. Since I took this photo, I’ve almost finished the second tree and have only the sun, some small window details and a little more customization to go. I plan to add a few bees buzzing around. Bees have always been one of my favorite motifs, because my name means “bee.” It amuses me to sneak in a couple on my projects when I can. 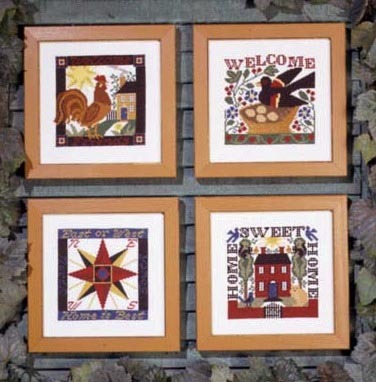 This Prairie Schooler chart is the companion piece for another cross stitch in my entrance hallway. 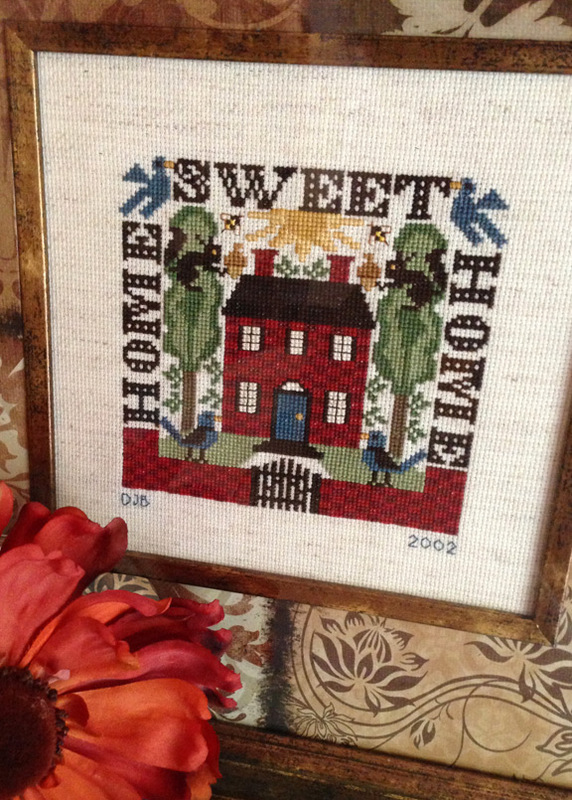 I’ve always found “Home Sweet Home” sentiments a little sappy, but the designs match so well that I couldn’t resist stitching both as a set. Amazingly, it’s been almost two years since my last post here, so I intend to remedy that right now. I simply haven’t been doing ANY stitching in the intervening time, which is why I’ve had nothing to blog about. Frankly, after my mother’s death in February of 2010, I lost the motivation to continue with any of my hobbies. You could say that I took a sort of sabbatical from crafting of any kind. I did run across my charts every once in a while, but didn’t have the heart to work on any existing projects, or start any new ones. Since there was no point in pushing myself, I decided to just wait until I felt ready again. It was just last week that I finally felt an urge to get back to my stitching. My big sister, who is also a crafter, is planning to visit at the end of the month. In preparation for her visit, I started straightening the guest room and found one of my many boxes of cloth neatly tucked away up on a shelf. This started me thinking about how I had shelved my current project basket those many months ago, and when I dragged it out I saw several envelopes full of charts that I had ordered back in 2010. Charts that I had so longed to work on once upon a time, but had abandoned. Loose charts that I had never even filed away for later. This made me sad. So I took my big binder of charts from the shelf, dusted it off and started flipping through its pages. I suddenly realized that it needed a good deal of organization now, and that was something I felt I could probably handle. Adding the new charts to my log, slipping them into their plastic sleeves and sorting them into the book had me reminiscing a bit about all of the work I’d stitched in the past, and all of the wonderful designs I had yet to do. Something inside of me flickered a little, and right then I decided to begin something. 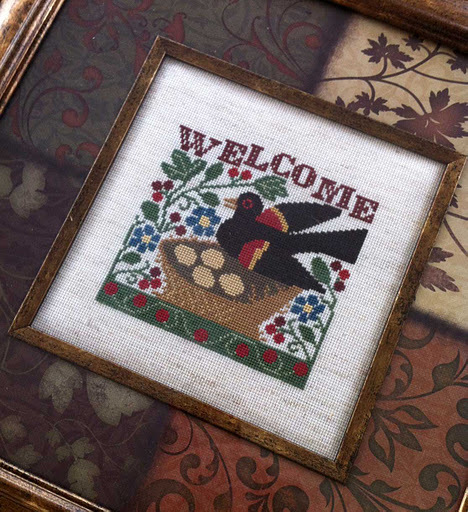 In my entrance hallway on one side of the large oval mirror hangs my Prairie Schooler “Welcome” blackbird. It used to reside in a glass topped tray, but didn’t look quite right there to my eye, and so migrated to a frame I’d picked up on the cheap from Tuesday Morning. There exists a matching and still empty frame for its companion piece, which I’d always planned to hang on the other side of the mirror, but never quite got around to choosing or starting. Family issues and all that getting in the way. 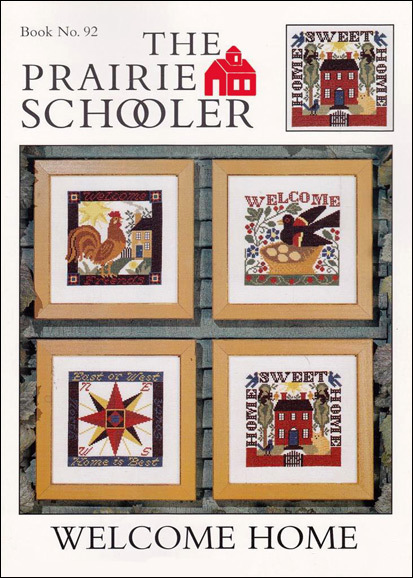 But now I’ve selected “Home Sweet Home” from the Prairie Schooler “Welcome Home” booklet #92 as my very next project. By stitching up this old design I can complete the hallway display that I planned so long ago, and in a way bring that chapter to a close. Perhaps then I will be ready to start something completely new. Before I could begin I had to locate some matching cloth. I found to my disappointment that I hadn’t more Fiddler’s Cloth left in the correct shade. Not to worry, though, as I did have some left in a lighter ivory tone which I proceeded to tea-dye to the right color. This experience was my first time ever tea-dying something, and I must say it was an easy exercise which took only a short time and gave me an excellent result. Now that I have my matching cloth ready, I must merely choose floss from my large supply and I can begin. Off to pick colors now.